Read for This Week’s Study: Matt. 24:30; Dan. 7:13-14; Matt. 11:27; Luke 5:17-26; John 8:58; Matt. 20:28. Memory Text: For even the Son of Man did not come to be served, but to serve, and to give His life a ransom for many (Mark 10:45, NKJV). After more than two years of public ministry, Jesus asked His disciples: Who do men say that I, the Son of Man, am? (Matt. 16:13, NKJV). It was not difficult for them to report what they had heard people saying about Jesus. More challenging, however, was Jesus’ next question: But who do you say that I am? (Matt. 16:15, NKJV). Now it became a personal issue. Jesus did not ask their opinions about His external appearance or about His character traits. His question, instead, went to the essence of Jesus’ very being. It required the disciples to express their individual conviction and faith. Sooner or later, everyone has to answer this same question. Each has to decide, individually, who Jesus is. It doesn’t help to repeat what other people say or believe; the answer must be genuinely our own personal belief. And, of course, on that answer the destiny of every human being hangs. This week we will seek the answer on the basis of what Jesus Himself said and did. Our aim will be to arrive, by faith, at the same response Peter gave: You are the Christ, the Son of the living God ( vs. 16 , NKJV). *Study this week’s lesson to prepare for Sabbath, July 12. This title, the Son of Man, was Jesus’ favorite designation for Himself. He referred to Himself as Son of Man more than eighty times. Other people never addressed Him that way. He, of course, selected this special designation for Himself with a purpose in mind. This idiomatic expression was common in the Old Testament. With just one exception, it always referred to a human; thus, Jesus used it in order to emphasize His humanity. Scripture presents Jesus as a true human being. He was born as a baby, grew up as a child (increasing in wisdom and in stature [Luke 2:40, 52]), and had sisters and brothers (Matt. 13:55-56). He ate (Matt. 9:11), slept (Luke 8:23), was tired (John 4:6), and suffered hunger and thirst (Matt. 4:2, John 19:28). He also experienced sorrow and distress (Matt. 26:37). To the casual observer, Jesus seemed to be a common man who walked among the people as one of the multitude. Many of His contemporaries did not recognize in Him anything more than a man (John 7:46). People treated Him as one of them; they laughed at Him (Luke 8:53), criticized Him (Matt. 11:19), even mocked and beat Him (Luke 22:63). To them, He was just another human being. One like the Son of Man came with the clouds of heaven to the Ancient of days, and received eternal dominion, glory, and a kingdom. The Jews identified this Son of Man with the Messiah. So, when Jesus used this title, He was revealing, in a half-concealed way, that He was also the promised Messiah, the incarnate Christ. Read Matthew 24:30, 25:31, 26:64. What elements in Jesus’ words recorded in these verses are reminiscent of Daniel 7:13-14? Why is it so important for us to know that Jesus was fully human? What implications does His full humanity have for our salvation? What implications does it have for our daily lives, especially in our battles with temptation and sin? The title Son of God was used not only by Gabriel (Luke 1:35) but also by several people when addressing Jesus (Matt. 14:33, Mark 15:39, John 1:49, 11:27). He accepted that title but was very careful not to apply it directly to Himself, lest He be stoned to death. Nevertheless, the Bible does reveal in different ways His special relationship with the Father. The Father acknowledged Jesus as His Son at His baptism (Matt. 3:17); the same as at the Transfiguration (Matt. 17:5). Their Father-Son relationship is unique. Christ is the only Being in the universe who enjoys that kind of relationship, because only He is of the very same nature as the Father. As believers, we have been granted the privilege of becoming children of God. But Jesus always was, is, and will be the Son of God. What do the following texts reveal about the perfect unity of the Father and the Son? Matt. 11:27, John 3:35, 5:17, and 10:30. The complete unity of Jesus and the Father includes a mutual and perfect knowledge of each other: a unity of will, purpose, and objectives. Moreover, it includes a unity of nature. The Son and the Father are two persons ( I and the Father ) but of the same nature ( are one ), a fact emphasized by the neuter pronoun one (compare with 1 Cor. 3:8). We have to be aware, however, that because He came to live as a man, Christ while here voluntarily subordinated Himself to the Father (Phil. 2:6-8). This limitation was functional but not part of His essence Himself. Jesus subordinated Himself for a specific purpose, a specific goal. With this concept in mind we can understand why Jesus said: the Son can do nothing of Himself, but what He sees the Father do (John 5:19, NKJV); because I do not seek My own will but the will of the Father who sent Me (John 5:30, NKJV). From this functional point of view, He could say: My Father is greater than I (John 14:28, NKJV). Jesus was fully God and fully human. What does this amazing truth tell us about the close link between heaven and earth? What comfort can we draw from this close connection? The deity of Christ is the foundation of our faith. A human being could never be our savior, no matter how extraordinary his life may have been. Throughout the entire New Testament, we have evidence of His divinity. We will focus on what Jesus Himself taught about this subject. It was, for starters, not a simple matter for Jesus to explain who He was. His mission required Him to make known that He was the Messiah, God in the flesh; however, there is no record of Him saying publicly, I am God or I am the Messiah. Had He done so, His life could have immediately been taken. Therefore, He chose to hint at His divine nature and indirectly led His hearers to know His deity. As Jesus gradually revealed His divine nature, most of His hearers understood Him but refused to accept His claim because it didn’t fit with their preconceived idea of the Messiah. This is evident by their request: How long do You keep us in doubt? If You are the Christ, tell us plainly (John 10:24, NKJV). Unfortunately, the context shows that their question was not sincere. As we saw yesterday, Jesus made many references to His special relationship with His Father. This was one of the methods He used to reveal His deity. Many understood clearly that when He said that God was His Father, He was making Himself equal with God (John 5:18). Read Luke 5:17-26. In what very powerful ways did Jesus here reveal His divinity without openly saying it? It required nothing less than creative power to restore health to that decaying body. The same voice that spoke life to man created from the dust of the earth had spoken life to the dying paralytic. — Ellen G. White, The Desire of Ages, pp. 269, 270. Jesus claimed the divine prerogative to forgive sins. He also said that He Himself will sit on the throne of His glory (Matt. 25:31, NKJV) and judge all the nations, deciding the eternal destiny of each one, something that rests on God’s authority alone. How much more could He have done here to reveal who He really was? Think about how hard-hearted some of these leaders were toward Jesus. And these men were supposed to be the spiritual guardians of the people? How can we make sure we don’t become hard-hearted in our own ways, as well? Jesus declared and demonstrated that He had the same power as the Father to overcome death. As the Father raises the dead and gives life to them, even so the Son gives life to whom He will (John 5:21, NKJV). Only God can state: I am the resurrection and the life (John 11:25, NKJV). Another clear indication of His divinity is found in His assertion to preexistence. He came down from heaven (John 3:13, NKJV) because the Father sent Him (John 5:23). Then, again, He reaffirmed His preexistence: And now, O Father, glorify Me together with Yourself, with the glory which I had with You before the world was (John 17:5, NKJV). Why is John 8:58 one of Jesus’ more direct and profound statements about His deity? See also Exod. 3:13-14. In contrast with Abraham, who came into being (which is the literal meaning of the Greek root ginomai, translated here as was, Jesus announced Himself to be the self-existent One. He was not only there before Abraham’s birth but existed eternally. I am implies continuous existence. Furthermore, I AM is the title of Yahweh Himself (Exod. 3:14). The leaders understood, unmistakably, that Jesus claimed to be the I AM revealed in the burning bush. For them, He was guilty of blasphemy and therefore they took up stones to throw at Him (John 8:59, NKJV). The Gospels show that Jesus, without showing disapproval, accepted worship from others. He knew very well that, according to the Scriptures, only God deserves man’s adoration, for He said to Satan: It is written, You shall worship the Lord your God, and Him only you shall serve. (Matt. 4:10, NKJV). Therefore, by accepting worship from others, He was revealing His divinity. The disciples on the sea (Matt. 14:33), the blind man healed (John 9:38), the women at Jesus’ tomb (Matt. 28:9) and the disciples in Galilee (Matt. 28:17) all worshiped Him openly, recognizing His deity. Thomas’s words to Jesus, My Lord and my God! (John 20:28, NKJV) would not have been spoken by a Jew back then unless he clearly understood that he was talking to God. Read John 20:29. What are things that you have not seen, yet believe in? What are the implications of your answer for the whole question of faith? After considering who Jesus was, we are in a better position to understand what He came to do for us. Satan made accusations against God. In order to meet those accusations, Jesus came to represent the Father’s character, and to correct the false concept that many had developed about the Godhead. He wanted us to know God, because to know Him is indispensable in order to have eternal life (John 17:3). However, we need more than knowledge to be saved. We need God to provide us a Savior, which is precisely the meaning of the name Jesus: Yahweh is salvation (Matt. 1:21). Jesus described His mission in very clear terms: the Son of Man has come to seek and to save that which was lost (Luke 19:10, NKJV). In Eden, humans lost their relationship with God, lost their holiness, lost their home, and lost eternal life. Jesus came to restore everything: He reestablishes our relationship with the Father (John 1:51); He forgives us our sins (Matt. 26:28); He gives us an example how to live (1 Pet. 2:21); and, of course, He gives us eternal life (John 3:16). How did Jesus define the essence of His mission? John 10:11, Matt. 20:28. Why did Jesus have to die? It was because He voluntarily took our place and bore the punishment of our sin. We are all sinners (Rom. 3:10-12) and, as such, deserve eternal death (Rom. 6:23). The price for our salvation was so high that only the life of the Son of God was enough to pay for it. The broken law of God demanded the life of the sinner. In all the universe there was but one who could, in behalf of man, satisfy its claims. Since the divine law is as sacred as God Himself, only one equal with God could make atonement for its transgression. None but Christ could redeem fallen man from the curse of the law and bring him again into harmony with Heaven. — Ellen G. White, Patriarchs and Prophets, p. 63. Look around at our world and the fate of us all in this world. If everything ended in the grave, what hope would we have? We would have none at all, were it not for the plan of salvation. How, then, can we show our gratefulness to God for what He has done for us in Christ? Further Study: Ellen G. White, Divine-Human Saviour, pp. 1126-1128 in The SDA Bible Commentary, vol. 5. While God’s Word speaks of the humanity of Christ when upon this earth, it also speaks decidedly regarding His pre-existence. The Word existed as a divine being, even as the eternal Son of God, in union and oneness with His Father. . . . The world was made by Him, and without him was not any thing made that was made (John 1:3). If Christ made all things, He existed before all things. The words spoken in regard to this are so decisive that no one need be left in doubt. Christ was God essentially, and in the highest sense. He was with God from all eternity, God over all, blessed forevermore. The Lord Jesus Christ, the divine Son of God, existed from eternity, a distinct person, yet one with the Father. — Ellen G. White, Selected Messages, book 1, p. 247. In Christ is life, original, unborrowed, underived. He that hath the Son hath life. 1 John 5:12. The divinity of Christ is the believer’s assurance of eternal life. — Ellen G. White, The Desire of Ages, p. 530. Demons knew and confessed that Jesus was the Holy One of God (Mark 1:24, NKJV), the Son of God (Mark 3:11), Son of the Most High God (Mark 5:7, NKJV). See also James 2:19. Why is this kind of acknowledgment not enough for our salvation? How can we avoid the trap of being satisfied with a mere intellectual acceptance of Jesus? When the centurion, who was standing right in front of Jesus, saw how He died, he said, Truly this man was the Son of God (Mark 15:39). The best place to understand Jesus is at the foot of His cross. How often do you go there? When was the last time you were there? Why don’t you take a moment, right now, to meditate on the infinite sacrifice He made for your salvation? A good number of Jesus’ contemporaries rejected Him because they had wrong ideas about the Messiah. Unfortunately, many people today refuse to yield their lives to Jesus, because they have prejudices or a distorted concept about Him. How can we help them to see Jesus as He really is? What do we have as Seventh-day Adventists in particular that could help give them a clearer view of who Jesus really is? Believers in western Russia work together to win their neighbors—and sometimes thieves—to Jesus. They write the names of people for whom they are praying in a book at church. Then they deliver tracts or newsletters to those people during the week. One woman who owns a goat farm asked God who to pray for, and God showed her in an unusual way. The woman noticed that her goats were disappearing. Then she found a man lifting one of her goats from its pen. She stopped him. My family is hungry, the man said. If I sell the goat, they can eat. The woman asked the man to put the goat back into its pen while she prepared food for his family. She gave him the food and some missionary tracts as well. The man’s family read the tracts. The man now works as a goat herder for the Adventist woman, and his family worships with the Adventist congregation in town. Three sisters were praying for an apartment to rent. An old woman offered to rent them an apartment, and the sisters moved in. Then they discovered that their landlady spoke to the spirits. The sisters prayed for the woman, but they were afraid to speak to her about her alliance with the devil. Instead, they left some Bible tracts on the table where she would find them. The woman picked up the tracts and read them. One of the tracts dealt with the devil’s skillful lies. While reading it, the landlady realized that her alliance was with the devil. The landlady has asked the sisters for more tracts and a book about God. Through their faithfulness in sharing their faith, a congregation has grown. But the members had no church in which to meet. The nearest church was several miles away in another town. They struggled to raise money for a church until the Thirteenth Sabbath Offering helped make their dream a reality. Today a simple church stands in this town in western Russia, a lighthouse and a testimony to the power of many working together as one to finish God’s work. 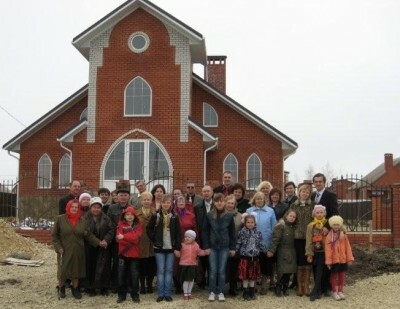 Members celebrate their new church in Temryuk, Russia.